This week’s Photo of the Week was not taken by me. It was taken by my dear friend Denise. Look at the size of that trophy! 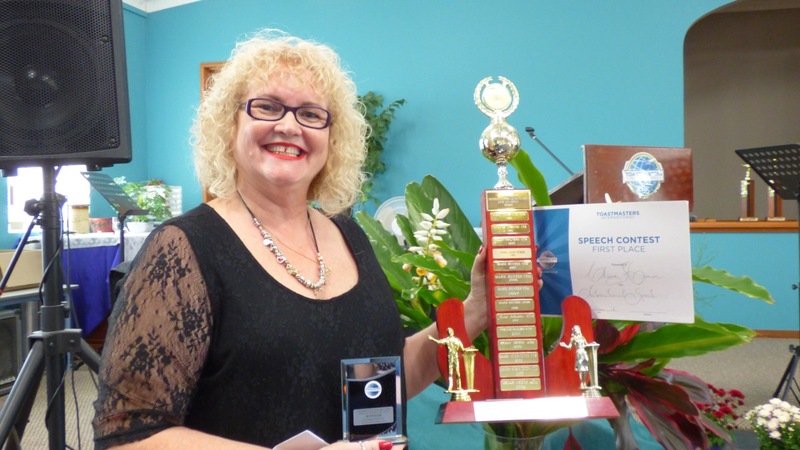 On Saturday I won the International Speech Contest at the Toastmasters Area 22 Conference. I was representing my club (Kawana Waters) having won at that level back in September. Just as it was an honour to represent my club at the area level, I’m equally honoured to now move forward and represent my area at the division level. That conference is being held in March next year, so I’ve plenty of time to hone and polish my speech even further. It was incredible presenting my speech on Saturday to a room full of notable Toastmasters including the President of Toastmasters International, our District Director, our Division Director, as well as our Area Director, my club President and so many of my Toastmaster friends. What a thrill! And yes – I’m still grinning from ear to ear. Way to be awesome! Beautiful You!